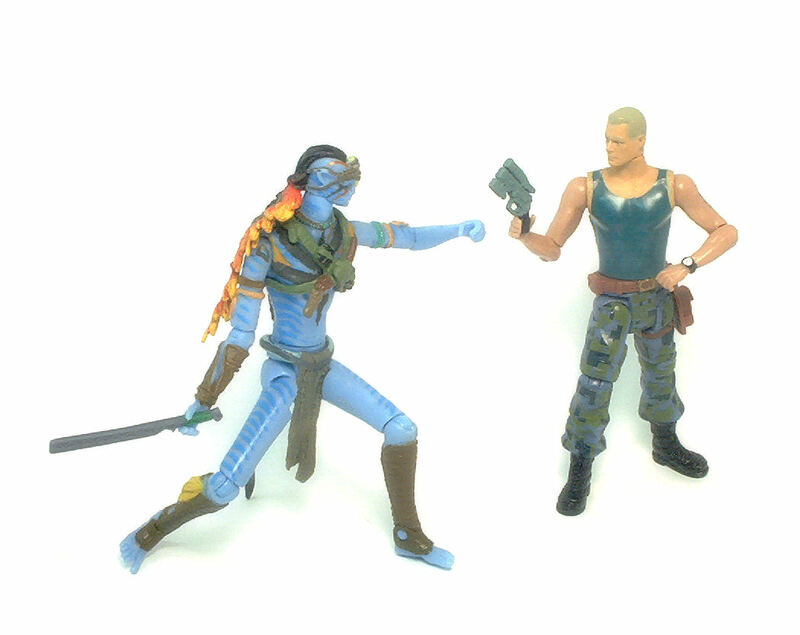 Even though James Cameron’s Avatar movie has it’s share of detractors, one thing most everybody agrees is that the main antagonist was actually a pretty awesome villain. But I digress; Quaritch is attired with a turquoise blue wife-beater and baggy blue fatigue pants with a digital camouflage print applied in green and blue. The level of sculpted detail is somewhat inconsistent, because even though the body proportions appear to be correct, the upper torso is sculpted smooth with only the slightest hint of musculature in it and the t-shirt just painted over the surface. On the other hand, the legs display a good amount of sculpted detail in the form of wrinkles and seams, with the footwear also displaying a fairly complex pattern on the shoelaces and sculpted tread patterns at the soles. 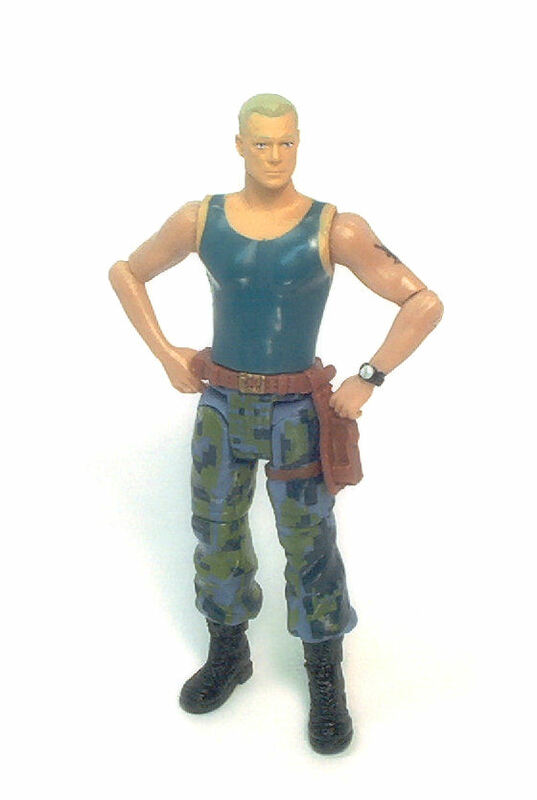 Again, Mattel provides an excellent head sculpt, and even though the coloring doesn’t really work towards facilitating the resemblance to actor Stephen Lang, the end result is still recognizable. 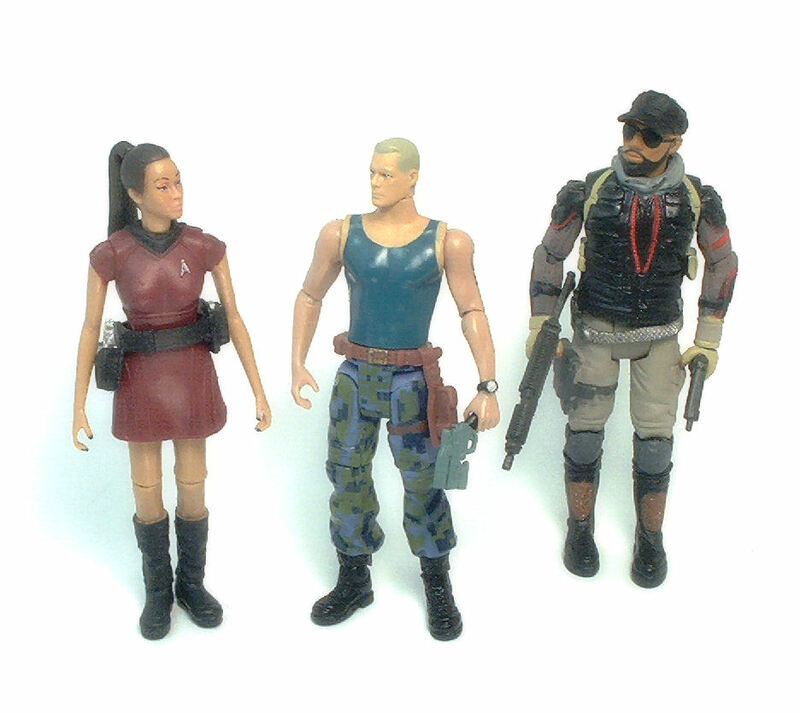 Now, even though the Avatar human figures are noticeably smaller than figures from other manufacturers working the same scale, Miles has some problems blending in with even the other RDA human figures. Quaritch measures the same as the human versions of Norm Spellman and Grace Augustine but due to his almost-bare upper torso, he ends up looking skinnier than both of them. I don’t know if in real life Stephen Lang is just an average built man, but in the movie he looked like a buff, mean, soldier-type and that doesn’t really carry over to this figure. 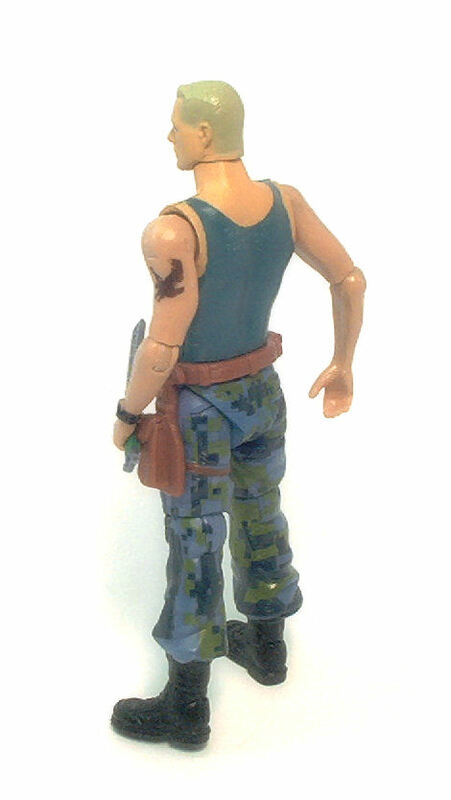 Miles has a non-functional holster hanging from the left side of his belt piece, but thankfully it doesn’t really get in the way of the articulation. The paintjob was kept relatively simple on Miles. As mentioned, the t-shirt is painted on and the paint is applied neatly for the most part, although it is always advisable to look out for wavy lines or irregular edges. 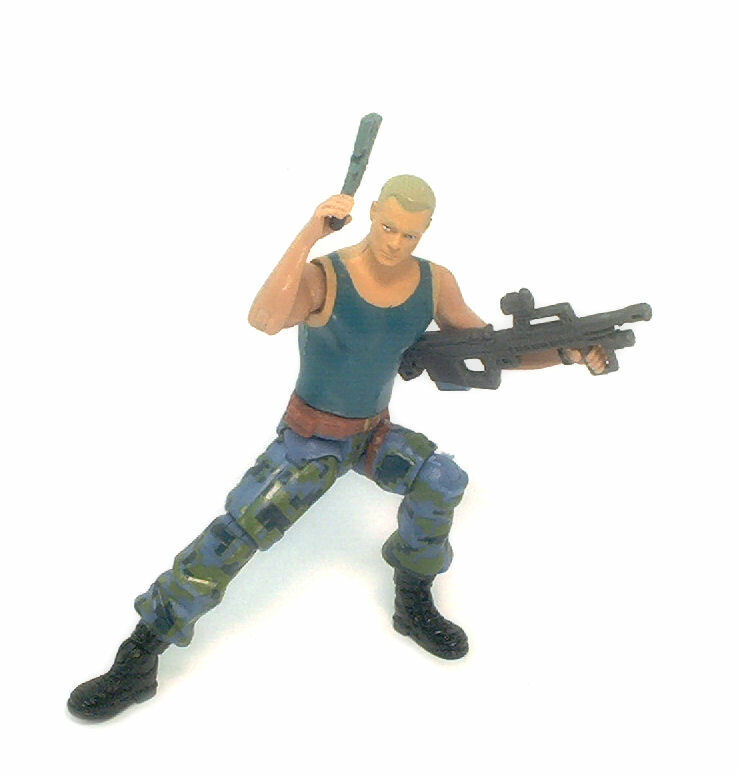 The pants are molded in grayish blue plastic, with brighter green and darker blue rectangles forming a pretty decent approximation to the digital cammo patterns seen in the movie. Boots are painted solid black with a gloss finish to them. The paint on the face is good in general, but the scars on the right of his head are not immediately evident amidst the gray used for the hair. Also, Miles has a tattoo on his left arm, painted in black and representing a diving eagle. 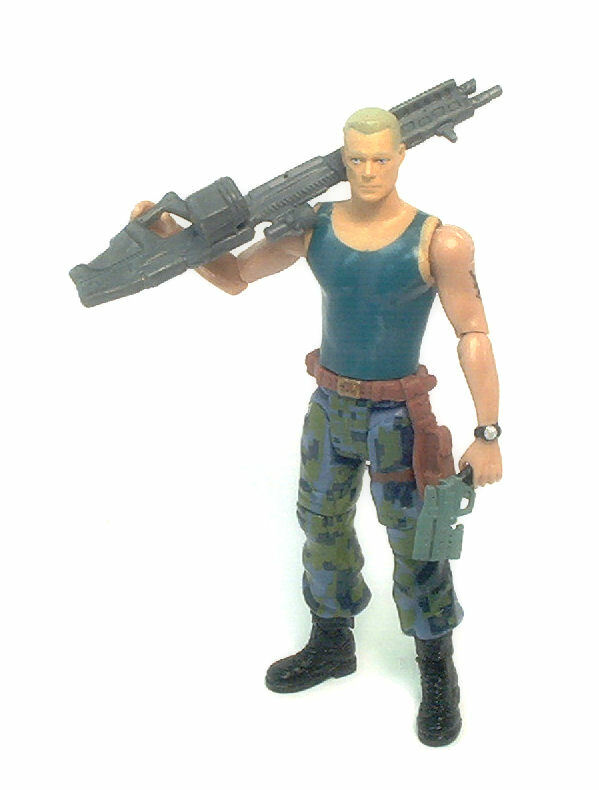 As far as weapons go, Miles comes armed with a modified Magnum revolver, fitted with a sight and an under-slung flashlight attachment. 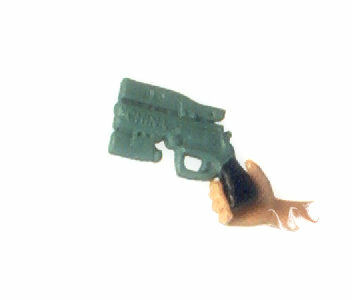 The weapon is molded in a bluish gray plastic with only the handle painted in matte black. 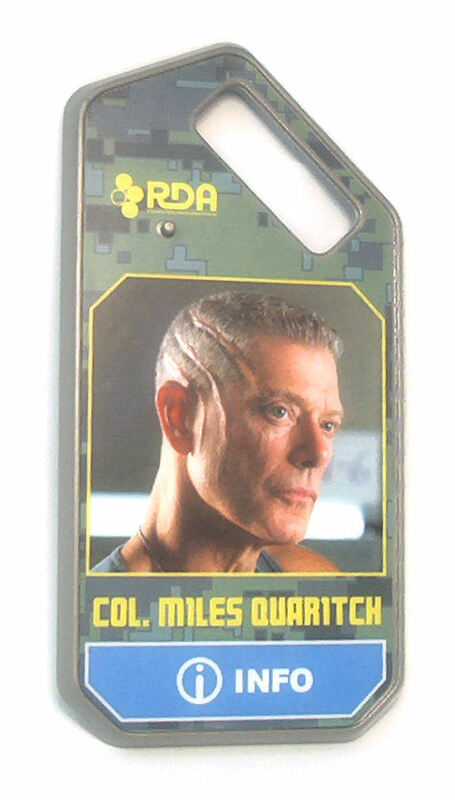 Quaritch’s iTagbase plate is molded in the square-ish, machined look of the RDA dog-tags and has a sticker on top with his portrait. The CGI model the plate generates after you log into Mattel’s Avatar site is that of a Dragon Gunship, the massive flying weapons platform used to direct the attack against the Na’vi. The trivia tidbits that sprout when you cover the Info icon on the iTag are military specifications on the ship and it’s armament, which I actually found interesting (and a little far-fetched, all things said). Even though human figures in this line are at an apparent disadvantage when compared against similar offerings by rival toy companies, Mattel still manages to deliver a pretty satisfying product by virtue of the quality of the materials used and the level of consistency in the design of the line as a whole. 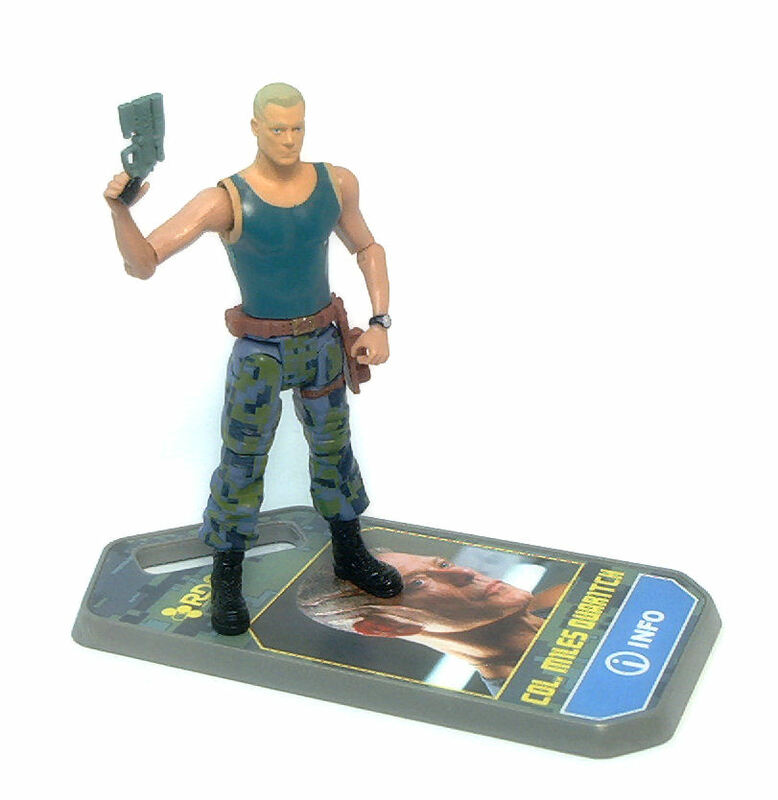 Yes, this Miles Quaritch figure may not be among the better offerings in the Avatar line-up, but it doesn’t fall too far behind either. It makes for a fairly decent military figure and besides, you will definitely want one if you ever plan on getting the AMP Suit.